It's one thing to know how to use fertilizer for lucky bamboo but it's just as important to know when to use it. It is rare that you'll need to use fertilizer for this plant. Lucky bamboo can go for years without fertilizer. Caring for lucky bamboo sometimes feels as though you're neglecting the plant when compared to other houseplants. Lucky bamboo gets all the nutrients it needs from water since it thrives on nitrogen. This is why you want to change out the water regularly. Since lucky bamboo is a water plant, it requires a clean water environment. This is ideal since most tap water contains the nutrients Lucky Bamboo needs, although fluoride and chlorine are harmful, so filtered water is the best. Nitrogen is the main nutrient followed by magnesium and iron. There are some instances when you may need to fertilize your lucky bamboo. Each one is easy to remedy with the right fertilizer and more importantly, the right amount of fertilizer. Be sure you add fertilizer to the soil or water and never as a spritz. Only use water to spritz the leaves if desired. One time you may need fertilizer is if you're using distilled water since magnesium and iron are lost in the distillation process. A few drops of fertilizer is all you'll need, if that much. It depends on the fertilizer instructions and water to fertilizer ratio. Be sure to follow the manufacturer's guidelines. If you desire to stimulate leaf growth, this can be accomplished by adding a little fertilizer to the water. It's best to do this during the natural cycle of the spring growing season. If your lucky bamboo leaves are turning yellow and you haven't used fertilizer, the plant may be suffering from a lack of nutrients. In this case, you'll need to fertilize it. Most lucky bamboo arrangements feature a number of stalks. If a stalk turns yellow, it's best to discard and replace. If you've fertilized your plant, and it turned yellow, this indicates over-fertilizing. The best you can do at this point is change out the water and hope your plant will recover. You can use distilled water for a while to let the plant rest. Once it recovers, you can go back to using regular water. It's best to use fertilizers made specifically for lucky bamboo plants. Most lucky bamboo fertilizers are NPK with trace elements. These are usually in a ratio of 2-2-2, meaning, they have a balanced 2 parts ratio of nitrogen (N), phosphorous (P) and potassium (K). 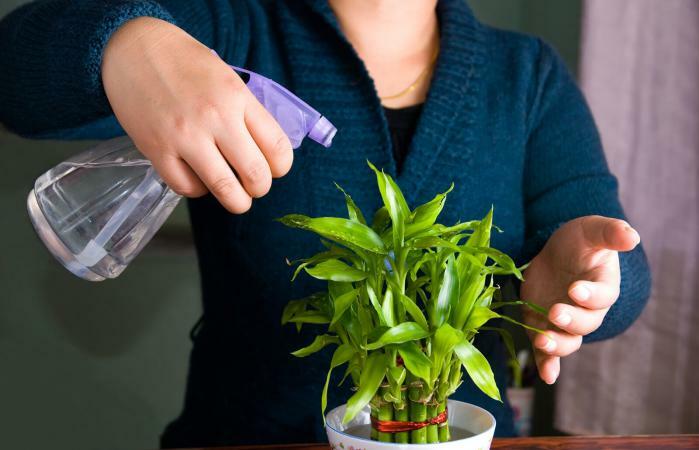 If you prefer to use a houseplant fertilizer, you can dilute it to be a suitable strength for lucky bamboo. Be sure you use an NPK balanced fertilizer. If you aren't using fertilizer made for lucky bamboo, you can dilute regular houseplant fertilizer. The strength should be around one-tenth less than what you'd use for houseplants. Less is always better. You can increase the strength if needed. If your plant is potted in soil, then you can use a diluted houseplant fertilizer every six to eight weeks. For a water-based plant using diluted houseplant fertilizer, you'll use the same ratio of diluted fertilizer to water as the soil-based plant. You'll only need to fertilize once every quarter (every 3-months). 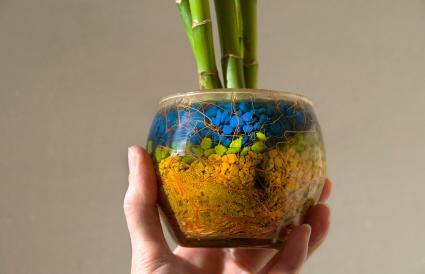 Growing lucky bamboo is very easy, especially when you use a water-based container. Follow the guidelines for how and when to use fertilizer and your lucky bamboo plant will last for many years.